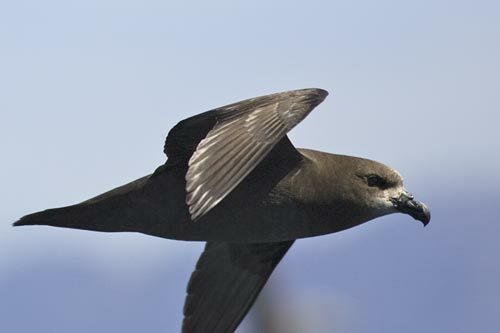 Great-winged Petrel: Breeds on offshore islands and coastal headlands and cliffs of northern New Zealand. Pelagic, comes ashore only to breed. Most petrel species can regurgitate their stomach oil as a defense mechanism against predators. Petrels are tireless fliers by day, at night they rest on the water; many return to land only to breed. Petrels typically have long nostrils, indicating a strong sense of smell, unusual for birds. A group of petrels are collectively known as a "gallon" and a "tank" of petrels.